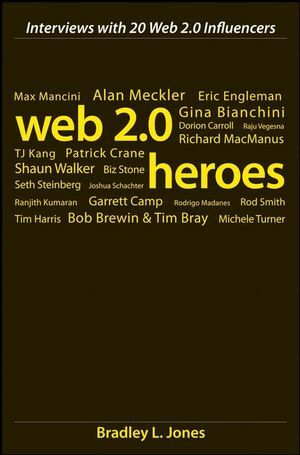 Web 2.0 may be an elusive concept, but one thing is certain: using the Web as merely a means of retrieving and displaying information is history. Today?s Web is immediate, interactive, innovative. It is user-controlled and community-driven. Organizations, marketers, application developers, and communicators must be ready to respond and to innovate or be left behind, and the experts featured on these pages are leading the charge. Their ideas are fresh, sometimes experimental, necessarily flexible, and always on the leading edge to prepare you for a Web where users rule. Bradley L. Jones manages various high-profile sites for Jupitermedia (internet.com) that focus on making technical information easy to understand and easy to learn. He oversees a dozen sites including Developer.com, DevX, Gamelan.com, VBForums, jGuru, and Java Boutique. In addition, he writes a weekly e-newsletter and numerous articles devoted to helping readers understand complex topics. He is an internationally bestselling author with a number of books to his credit, and has been recognized as an influencer in the technical community. 7 Richard MacManus: Read/WriteWeb & Web 2.0 Workgroup. 17 Rod Smith: IBM Corporation. 18 Tim Harris: Microsoft Corporation. 19 Bob Brewin & Tim Bray: Sun Microsystems. 20 Michele Turner:Adobe Systems Incorporated.